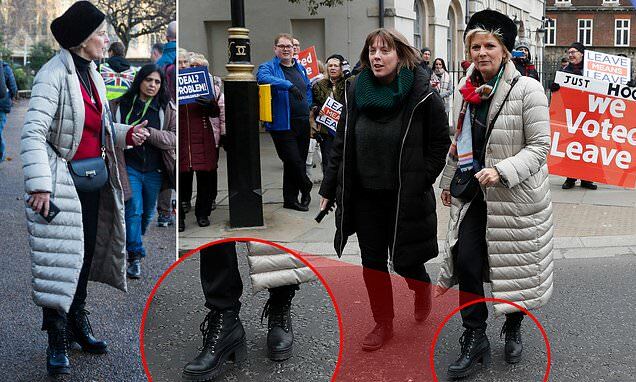 The Tory MP branded a 'Nazi' by furious Yellow Vest Brexiteers says she wears shoes that enable a quick getaway. She told The Times that she positions herself far from the tracks of the London Underground for fear 'that someone could push me on the line'. 'When I am in London and take the Tube I always keep my back to the wall,' she said. It comes as police were accused of 'wishy washy' policing outside the Houses of Parliament. Pro-Brexit protesters have been mirroring French demonstrations in Paris by donning yellow safety vests. On Saturday left-wing activists are set to wear the jackets as they march through the capital to demand a general election. But prosecutors are currently assessing whether the yellow vested protesters who harangued politicians like Ms Soubry outside the Houses of Parliament may have committed an offence. It follows a series of incidents in which politicians were filmed being confronted by protesters. On Monday, Ms Soubry's live television interviews opposite Parliament on College Green were interrupted by chants branding her a 'Nazi' and a 'liar'. Scotland Yard said police investigating 'a number' of allegations have requested advice from the Crown Prosecution Service (CPS).